Editing pages usually requires using multiple widgets. 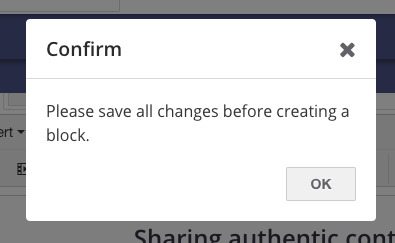 If I want to add a new widget, I always get the message 'Please save all changes before creating a block' (please see the screenshot ). This leads to multiple clicks before I can continue editing which is not an efficient use of the course designer's time. Please see the attached screencast. What was the reason behind adding this particular feature? (It wasn't the case in the past). Is there a way how not to get this message during the process of page editing?